First and foremost, we have to discuss Attention when speaking of memory techniques. It all starts with attention! Without attention you can not really encode information that you want to remember. You can improve your attention by feeding back what you heard. That’s right! Simply repeating what you heard silently or perhaps outloud so that you clarify for yourself and get clarity from a person if they are giving you the information. Reducing the rate at which information is coming to you is another important memory strategy for improving attention. You can take a break if you are studying new information and encode the new material more slowly. To maintain focus, eliminate distractions in your environment. Turn off the TV, put your mobile phone on vibrate, etc. Focusing on encoding information is the first memory technique. Improve your organization of the information to be encoded into memory. You can do this by grouping information into categories, counting the information to be remembered for later retrieval, or associating the information with a current memory. Imagine in your mind a large filing cabinet in which you store information by categories. A well known memory method is called “chunking”. Remember a series of numbers more easily like this – 358912 becomes 35 89 12. You can also use a well know memory method such as the PQRST method. Let’s say you want to read a chapter of a book which there is information you wish to remember. First, P means Preview the material before you read it. Q means to formulate Questions based on your Preview. R –Read the information. S refers to Stating aloud answers to the questions you posed. Finally, T is for Testing yourself by answering the questions without first re-reading the material. Another time tested memory technique is to use Visual Imagery. Basically, you formulate a visual image of the information you want to remember. You are now using the right hemisphere of your brain! If the mental images you desire to recall are strange or bizarre, so much the better. If you want to member to go by the market before you go home; imagine the butter you wish to pick you hanging from the sign of the supermarket. Other memory techniques include the Pegboard Technique, Rhyming, Acronyms, or Face-Name Association. With this method, you relate a persons name that you meet with some noticeable physical feature through mental imagery. You can remember my name Wolf by associating it with my hair and then associate it with a hairy wolf. Latter to recall my name when you see my hair you will recall the name Wolf more easily. There are many other memory techniques that really don't take a lot of time to master. You may find one of the books below to be useful in developing an amazing memory. 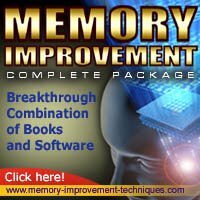 The Memory Workbook: Breakthrough Techniques to Exercise Your Brain and Improve Your Memory by Douglas J. Mason, Michael Lee Kohn and Karen A. Clark.